celebrating their 10th Anniversary and Japan Tour 2014! Three pop-up ‘Cafe Il-Divo’s have opened on Feb 5 in Tokyo and Osaka to celebrate the band’s 10th anniversary & their upcoming Japan Tour 2014 (Feb 26 – March 11). IL DIVO’s latest album “A MUSICAL AFFAIR” (2013 ) is their first album covering famous musical tunes, and was released first in Japan, before the rest of the world. 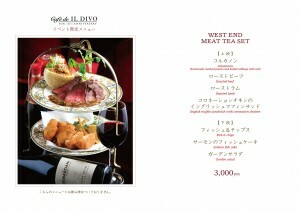 The cafes are serving special menus inspired by the cuisine’s of the guys’ four home countries and the title of their songs. 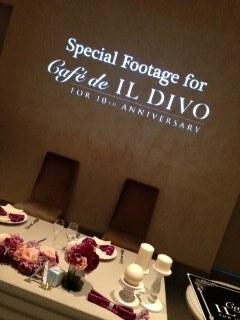 Special footage, CD artwork, posters, and panels are exhibited in the café, spanning IL DIVO’s 10 year history and visitors will be able to take photos with life-sized panels of the guys (*note: life-sized panels exhibited in Osaka only). The cafes will be open until March 12 in Tokyo and Osaka in the following locations.